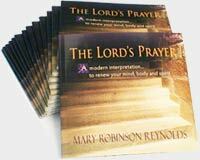 The whole Lord's Prayer Movie in Print! Enlighten your day, and your life! It fits in anywhere: in your purse, desk, briefcase. Great meaningful gift idea for reaching out to make a difference, stay connected with friends, family, colleagues, customers and clients. 1. Pray that watching the inspirational movie benefits your congregation and to know how best to incorporate the movie within your message. 2. Tell the congregation how long the inspirational movie is going to be and that there will be 30-seconds of silence after the video to allow people to think about what they watched and read a scripture passage related to the video. 3. Explain to them what they are going to see and/or put a description in your bulletin. 4. After the inspirational movie plays, allow 30-seconds for them to think about the video and read a scripture passage related to the video. 5. Explain what you just watched. And if time allows, be willing to field insights. 6. 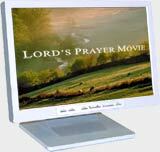 Continue using inspirational movies to keep people "awake to" and "engaged in" your message. 7. Because of various church size visibility issues, we recommend that you read along with the movie over your speaker system. You may want to use two voices; one voice for The Prayer and one for the interpretation. Your purchase entitles you to create one back-up copy, and you may show the movie publicly in your presentation or event. Personal Use for Full Screen Viewing: Meaningful, peaceful images are the size of your full screen. Make A Difference inspirational movies help you to immediately reduce stress, enhance your cognitive functioning, and improve productivity and creativity. Music combined with inspired messages of hope, restores faith, renews the mind and opens the way for peaceful solutions that you seek. Watch it first thing in the morning before beginning your work day and last thing of the day before retiring to help you connect with your inner wisdom, creativity and peace. You control the volume and you can start and stop it as you wish. As a Full-Movie Screensaver: You can set the number of minutes of inactivity before it starts to play quietly. The volume is lower and the images are higher resolution than the online version.